The Tapti River ancient original name Tapi River, is a river in central India. It is one of the major rivers of peninsular India with a length of around 724 kilometres (450 mi). It is one of only three rivers in peninsular India that run from east to west - the others being the Narmada River and the Mahi River. The river rises in the eastern Satpura Range of southern Madhya Pradesh state, and flows westward, draining Madhya Pradesh's Nimar region, Maharashtra's Kandesh and east Vidarbha regions in the northwest corner of the Deccan Plateau and south Gujarat, before emptying into the Gulf of Cambay of the Arabian Sea, in the Surat District of Gujarat. The river, along with the northern parallel Narmada river, form the boundaries between North and South India. The Western Ghats or Sahyadri range starts south of the Tapti River near the border of Gujarat and Maharashtra. 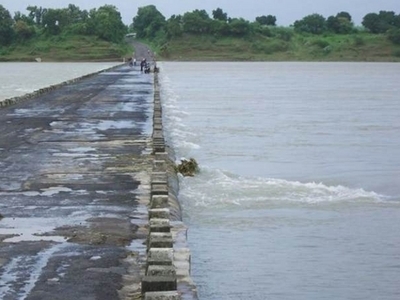 The Tapti (Tapi) River empties into the Gulf of Khambhat near the city of Surat in Gujarat. The Tapi River basin encompasses an area of 65,145 km sq, which is nearly two percent of the total area of India. The basin lies in the states of Maharashtra (51,504 km sq), Madhya Pradesh (9,804 km sq) and Gujarat (3,837 km sq).The basin lies mostly in the northern and eastern districts Maharashtra state, including Amravati, Akola, Buldhana, Washim, Jalgaon, Dhule, Nandurbar, and Nashik districts, but also includes the Betul and Burhanpur districts of Madhya Pradesh and the Surat and Tapi district (Vyara)(named after river tapi)of Gujarat. Major towns along the river include Multai, Nepanagar, Betul and Burhanpur in Madhya Pradesh, Bhusawal in Maharashtra and Surat in Gujarat.Major crossings of the river include the road bridge Sawalde in Dhule for National Highway 3 and the railway bridge at Bhusawal for the Bhusawal - Khandwa section of the Central Railway.The river is dammed by Hatnur Dam in Jalgaon, Maharashtra and Ukai Dam in Songadh, Gujarat. There are also small barrages created on Tapi in Shahada( Near Prakasha and Near Sarangkheda). Prakasha is considered one of the holy places and has a temple of Lord Shiva, named Kedareshwar. It is one of the oldest villages in the area.Other important sites along the river include the Melghat Tiger Reserve in Amravati district, part of Project Tiger, on the southeast bank along the Madhya Pradesh and Maharashtra boundary. Historical landmarks include the Asirgarh fortress near Burhanpur, also known as the "key to the Deccan", and the ancient Temple of Changdeo Maharaj at Changdev in Jalgaon. Here's the our members favorite photos of "Rivers in Madhya Pradesh". Upload your photo of Tapti River! Connect with Maneeskumar and Premraj Pushpakaran who have already visited Tapti River.